Perform all services with excellence. Ensure the highest quality, integrity and excellence in all that we do. Increase NASBA’s visibility and presence at meetings of relevant standard setters, regulators, and professional organizations. Maintain the integrity of CPA mobility through support of statutory and regulatory uniformity among the Boards. Work to ensure there is an effective and transparent peer review program. Support the Boards by providing communication services as requested. Maintain sensitive data and networks in a highly secure manner. Take a leadership role and collaborate with other regulated professions to address common regulatory and legislative concerns. 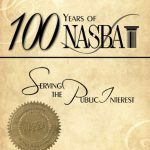 Support the NASBA Center for the Public Trust. Provide high quality on demand online content to allow additional training options for state Board members and Board staff. Communicate emerging issues to the Boards in a timely manner and educate the Boards regarding implications for their work. Ensure the Uniform CPA Examination remains relevant and reflects the essential knowledge and skills required of new licensees in a rapidly changing environment. Increase the visibility of NASBA leaders to external stakeholders. Ensure the effective ongoing use of technology.